MERIWAN, — Deliberate ignition of Kurdistan’s forests by the Iranian Revolution Guards Corps (IRGC) continues relentlessly, local sources report, to deprive ostensibly the Kurdish guerrillas of the natural shelters. During the last summer more than 170 instances of fires only in Meriwan and Sewlawa forests have been reported this year. In the last week, once again the forests of Dolebe district of Meriwan city were set on fires inflicting heavy losses on the natural lives and the region environment. 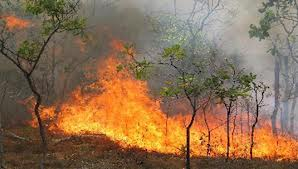 According to local sources forest conflagrations in Dolebe village which occurred several times in the last week, damaged the countryside extensively. This pattern of conflagration is highly likely to be induced by the Dolebe military compound, the sources alleged, for this reason no efforts being made to uncover the underlying cause of such conflagrations. According to Green Assembly of Mountains in Meriwan more than 170 instances of forest fires have been recorded within the course of last summer. It should be pointed out that in all these cases of forest fires, only the local people and the ecological institutions have tried to extinguish the fires. In many case, the eye witnesses said, the state officials and the Revolution Guards have prevented people from putting out the fires.